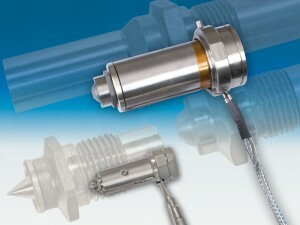 The range of Techni Shot hot-runner nozzles has been extended with open torpedo tips also for needle valve applications. With these nozzles, available both as mono nozzles for simple applications and for injection moulding tools with hot runners, immersion depths up to 300 mm can be achieved and medium-sized mouldings up to approx. 1700 g shot weight per nozzle can be produced. In addition, a variety of tried and tested tip geometries, materials and screw-on gate chambers are available, enabling optimum heat conduction in the gate area to be combined with excellent resistance to abrasive wear even for high-grade filled plastics. Another new addition to the Techni Shot nozzle range is the Type 20 size, designed for small shot weights and small cavity-to-cavity distances. A defined sealing surface on the locking nut ensures low heat transfer. As for all new developments, special emphasis has been placed on maintenance friendliness. This is ensured through full replaceability of all the relevant components such as the heating unit, thermocouples, nozzle body, tips and locking nut. A special design feature allows the thermocouple to be changed without removing the nozzle tip. This considerably reduces the work involved in maintenance. The nozzle is suitable for all material applications, particularly for engineering and reinforced plastics. The new heating system ensures uniform temperature distribution, resulting in a homogeneous heat profile along the entire flow channel. Due to the optimum positioning of the thermocouple on the nozzle tip and the titanium insulation, accurate temperature regulation is ensured. Our technical consultants and application technicians will be glad to support you in your choice of the optimum nozzle and nozzle tip for your specific application needs.